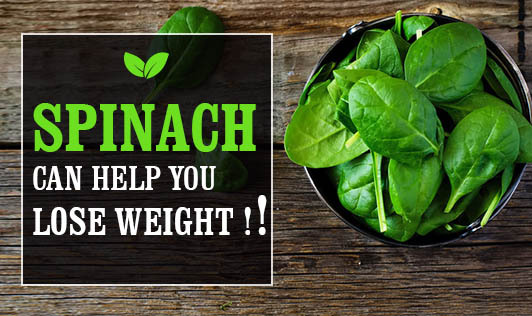 Spinach Can Help You Lose Weight !! You all know that Popeye's favorite super food is a nutrient dense food with various health benefits, but it's unlikely that you were aware that they act as a natural appetite suppressant too. Recently, researchers have discovered that sac-like green structures called thylakoids in green leafy vegetables decrease feeling of hunger and increase satiety. Thylakoids are disc shaped structures found within the chloroplast. Researchers have found that thylakoids slow down food digestion and reduce the hormone ‘ghrelin' (hormone which tells you that you're hungry). It also increasesthe hormonescholecystokinin and leptin. These hormones give you the feeling of satiety and regulate your calorie intake between meals. One needs to take at least 450 grams of green leafy vegetables daily for good health and weight control. If you are hungry, especially after meals, and trying to maintain weight, remember to include the leafy greens. You will not only be feeding your body nutrient dense fibrous food, but you will also be regulating your appetite hormones in your favor. There are no thylakoid supplements available in the market yet, but why think of supplements in the first place when you can just take a large serving of spinach just like Popeye!